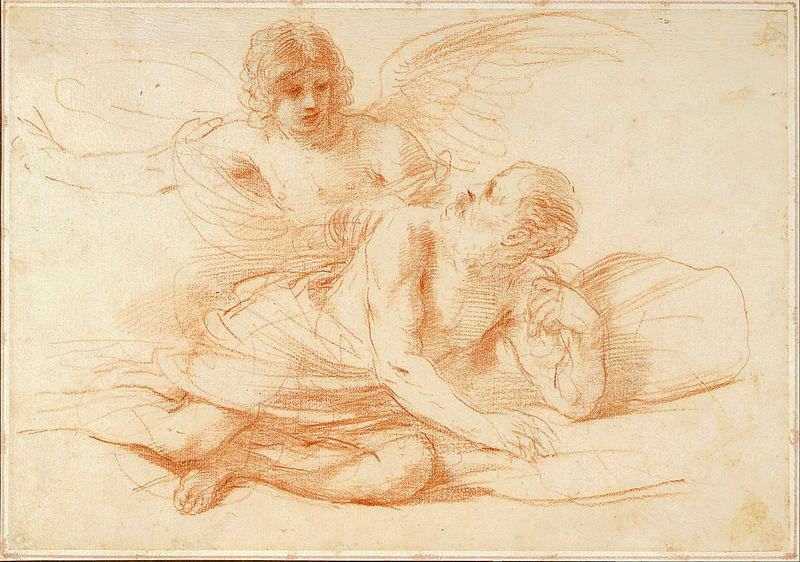 St. Peter and the Angel, by Giovanni F. Barbieri. Red chalk on paper, likely from the mid 17th century. The centrality of Peter to the history of the Papacy is undeniable. 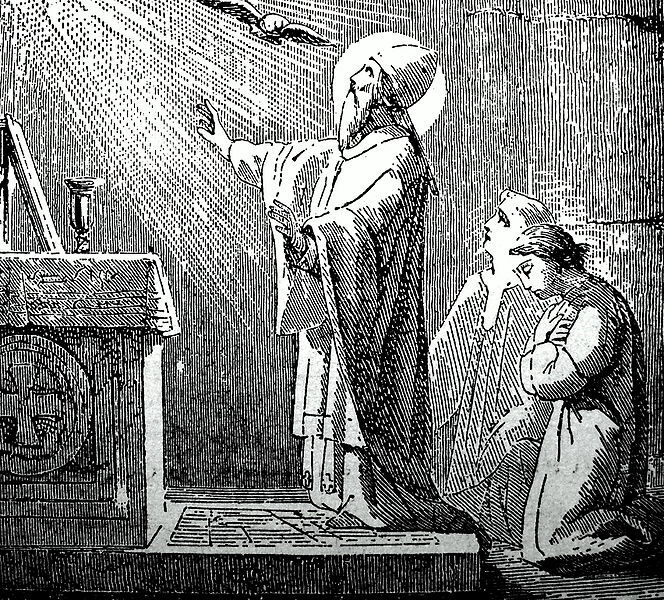 Seen as the one commanded by Christ to found his church, Peter is also accredited with being the first Bishop of Rome, the only truly formal title held by the Pope throughout history. As the Roman empire became increasingly divided into eastern and western halves, and as the western half fell into the chaos of waves of barbarian invasions, the role of the Bishop of Rome as the protector of his flock became increasingly important. Eventually, all of Western Christendom would swear loyalty to that one supreme bishop. 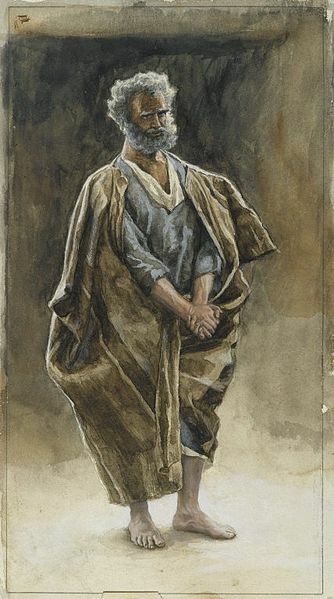 St. Peter once more, though this is late 19th century, by James Tissot. 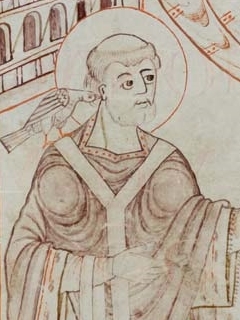 Gregory I (The Great or Magnus) shown dictating the performance of Gregorian chants. While they are named for him, most of the chants were composed well after his lifetime. Leo I (The Great) is among the most famous early popes, especially for his confrontation with Attila the Hun (pictured here). We think Leo essentially bribed the great warrior to leave his city and people alone. But no one really knows what was said in their exchange. 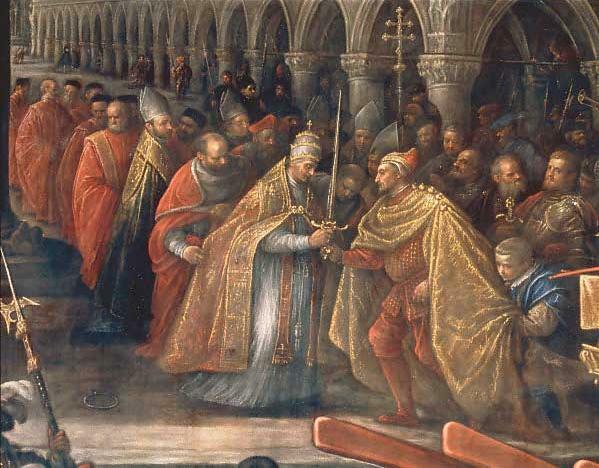 Pope giving a blessed sword tot he Doge of Venice. This image goes a long way in demonstrating the controversial proximity of many popes throughout history to secular and military affairs. Innocent III, one of the most powerful popes of the High Middle Ages and probably the man for concentrating Papal authority to its greatest extent. Taken from a 13th century manuscript, Chroniques de France ou de St. Denis. 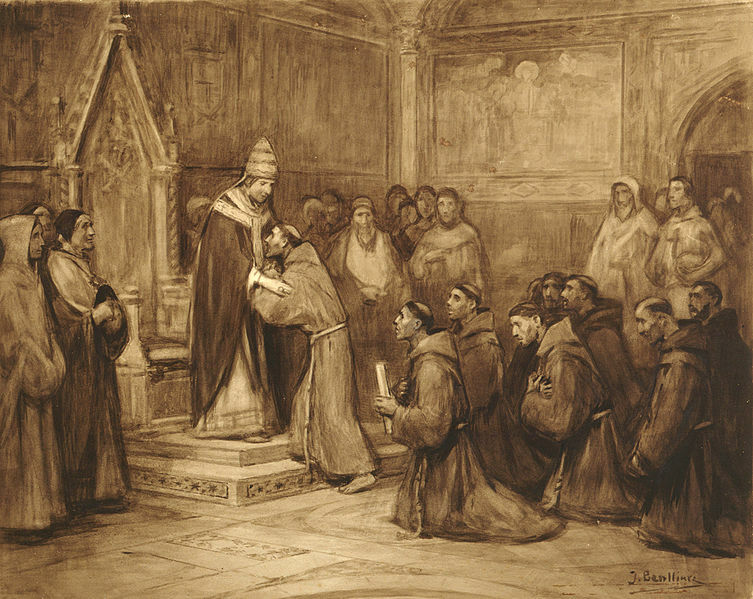 Innocent III again, in the midst of one of his most famous actions: giving his blessing to St. Francis of Assisi to create his mendicant order. 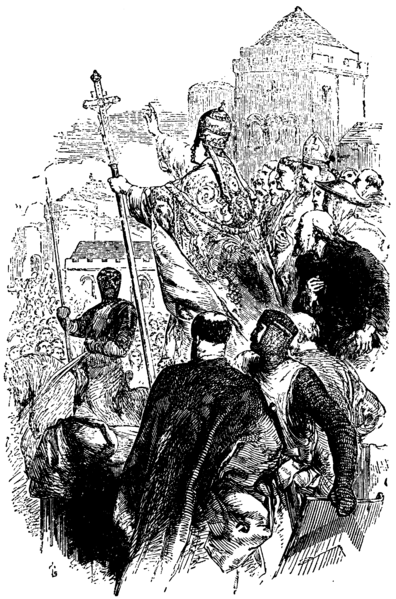 1878 plate showing Gregory VII saying Mass. One of the marks of his reign is his attempt to enhance papal control over the appointment of bishops, a move that puts him head to head with the Holy Roman Emperor, Henry IV, in what is known as the Investiture Controversy..
Urban II enjoining men to embark upon the Crusades. Knights were given the promise of plenary indulgences and the forgiveness of sins should they fight. While all bloody, the First Crusade was particularly so, and was the first contact many Arabs, Muslims and Jews in the east had with Western Christians. 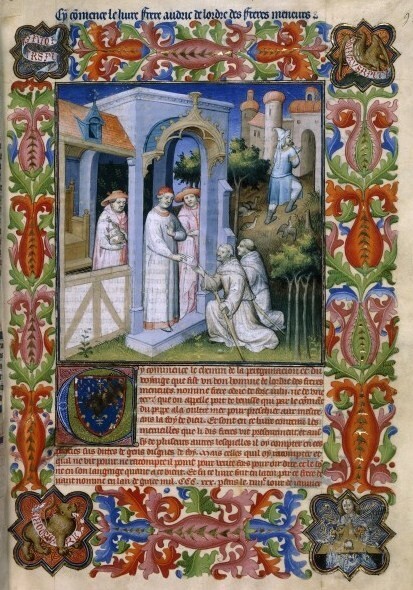 John XXII greets the famed Italian Traveler to the East, Odoric de Pordenone, likely at his Avignon residence. John XXII was the second pope of the infamous Avignon, papacy. This removal of the papal seat from Rome and the politics it sparked would ultimately lead to the Great Western Schism of 1378-1417. 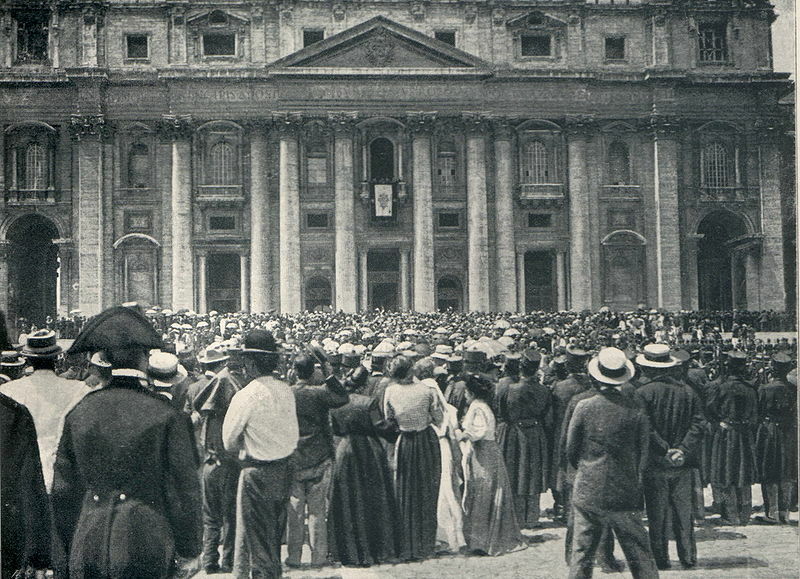 We can look upon this crowd from more than 100 years ago and assume that the same palpable excitement and anticipation raged in St. Peter's Square as it did this March. 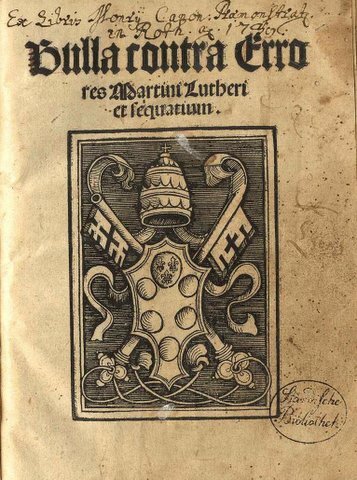 (Right) Papal bull condemning the errors of reformist monk Martin Luther, issued by Leo X on the 15th of June, 1520. Luther, not one to go unheard, responded with his own condemnation in his "Against the Execrable Bull of the Anti-Christ." 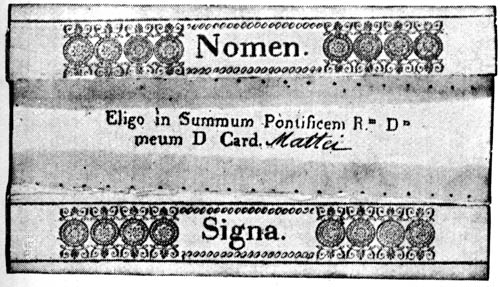 (Above) A folded Conclave ballot. We think it may be from the papal election of 1878. This would be the election of Leo XIII, an important pontiff who reinvigorated Thomistic study in the Catholic Church and without as well. 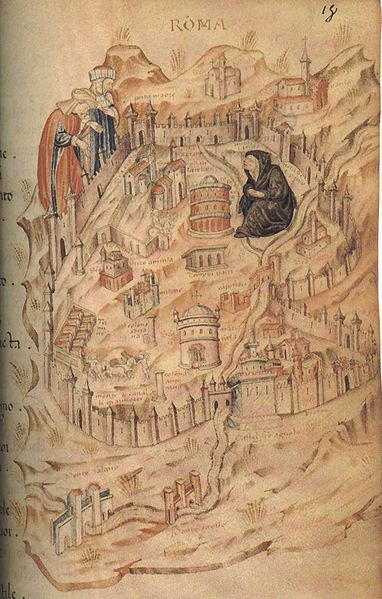 (Right) Allegory representing the city of Rome during the Avignon Papacy. This is an era when political intrigue causes the Papacy to move to Avignon, France for just under 70 years. In the painting, Rome is depicted as a widow left behind by her husband, the Church. 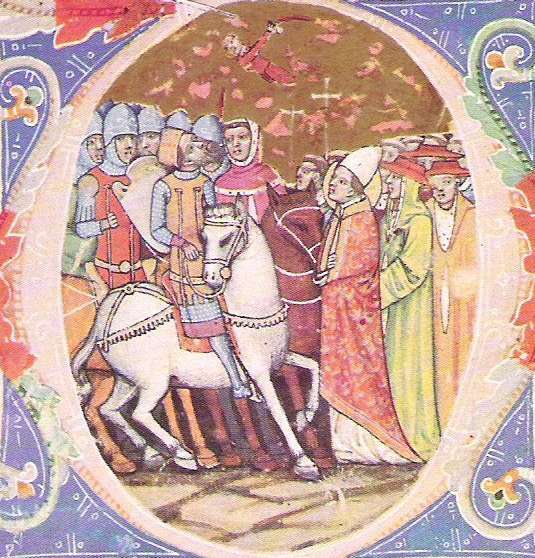 The Avignon Papacy and the reaction of Roman Church officials would be the primary cause of the Great Western Schism of the 14th century, a scandal that seriously compromised faith in Church leadership for a considerable period of time.